It’s been quite a rollercoaster ride for Michael Cohen and his family over the course of the last 18 months. 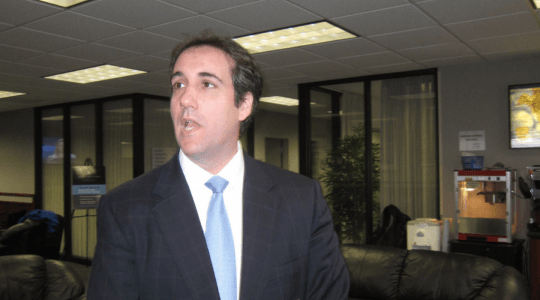 Cohen, Trump’s personal attorney for the better part of two decades, has found himself front and center in both the Mueller Probe and a separate investigation in the Southern District of New York, on top of the Stormy Daniels civil case. Over the last few weeks, media reports have indicated that Cohen is still on the fence in regards to possibly cooperating with investigators, who appear to be going after people much higher than him, including the President himself. On the other end of the spectrum, you have Roseanne Barr’s ex-husband and Hollywood star, Tom Arnold, investigating what he believes may be multiple tapes of Trump in compromising situations. Arnold is actually working with VICELAND on a new show titled, ‘The Hunt For The Trump Tapes With Tom Arnold,’ which is sure to be a hit, especially among Democrats and the ‘Never Trump’ crowd. So, what happens when you get the two of these men together in New York City? Apparently, you get answers! Shortly after this, NBC News reached out to Arnold who gave quite a few hints on how this meeting went. “We’ve been on the other side of the table and now we’re on the same side. It’s on! I hope he [Trump] sees the picture of me and Michael Cohen and it haunts his dreams,” Arnold told NBC News. He then went on to reveal a bombshell, which seems to indicate that Cohen is done playing around, and that both him and his wife are frustrated and let down by Trump’s behavior towards them. “I say to Michael, ‘Guess what? We’re taking Trump down together, and he’s so tired he’s like, ‘OK,’ and his wife is like, ‘OK, f*** Trump,'” Arnold laughed. Michael Cohen didn’t say Me & him were teaming up to take down Donald Trump! Michael has enough Trump on his plate. I’m the crazy person who said Me & Michael Cohen were teaming up to take down Trump of course. I meant it. Michael doesn’t get paid by Vice #thehuntforthetrumptapes. I owe Michael Cohen an apology because I made light of something that’s very serious for him. Michael Cohen knows more than any living human how serious and dangerous it is for America and the world right now because of how incompetent the president is. He knows the truth about everything and has the weight of the world on his shoulders right now. He is a father and is facing all of this. I didn’t mean to joke around about that. Michael Cohen has since referred all inquiries into this New York meeting to Tom Arnold, himself, indicating that Cohen trusts Arnold and the two men seem to be working together on this. What this also appears to indicate is that Cohen has likely decided to flip on the President, and if he does, the President’s deepest, darkest secrets will likely be revealed, not only to investigators, but to the American people via Arnold’s show.